Yeah well, it was raining… And I’ll be on holiday for quite some days from Tuesday on – without any computer. So this weekend was kind of the perfect time to hack a little bit on my neat little fun project ShadedBorder. Simplified Usage: You no longer have to manually set the “sb” class to the elements you wish to round. 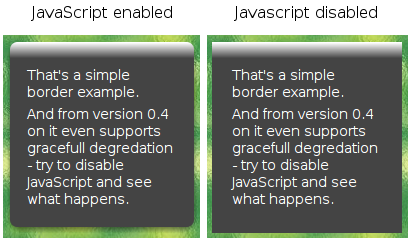 New example: Not really a feature, but it may help to see what’s really required to use ShadedBorder. Have a look at the source code of this page.